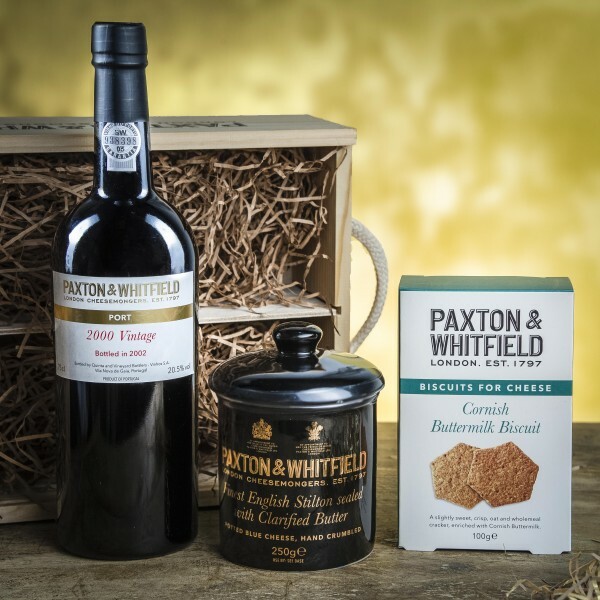 A traditional gift combining Paxtons finest Stilton, Vintage Port & Cornish Buttermilk Crackers. The perfect gift that combines some of the traditional flavours of Christmas, presented in a wooden gift box. Paxton & Whitfield Stilton Jar 250g - Rich and creamy premium grade blue stilton crumbled into a collectable Paxton & Whitfield jar, giving a spreadable paste (pasteurised, vegetarian). Paxton's Vintage Port - 75cl, specially selected 20 year old cask-aged Port that can be enjoyed for the next ten years. It has excellent fruit with good depth of flavour and substantial structure.